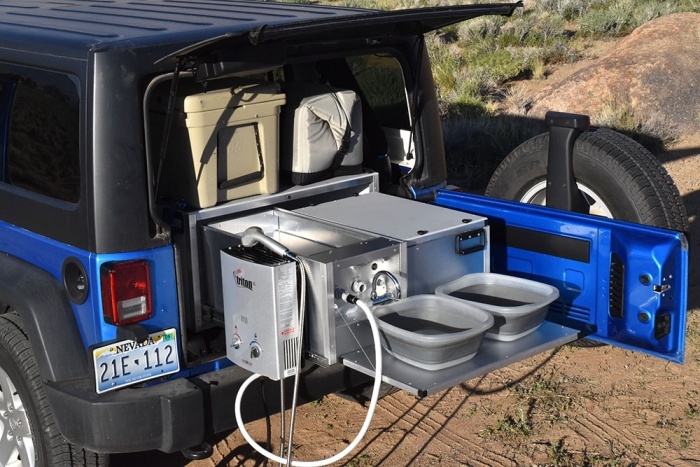 Add a two-bay sink, fridge, water heater, shower, and pull-out kitchen to your adventure rig with this system. The Wrangler (in Jeep) with included Compact Kitchen deployed on the ground. Driving to the campsite? Take everything—including the kitchen sink—with you, even if you’re just traveling in a small SUV. 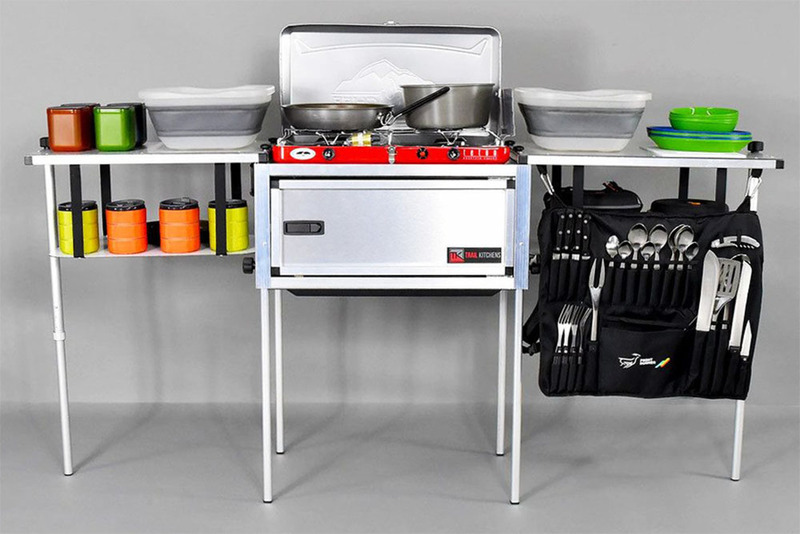 California-based Trail Kitchens offers an all-in-one, sliding storage system that accommodates dishes, cookware, prep surfaces, water tank, and more. The whole unit weighs just over 100 pounds. Launched this month, the unit packs down small enough to fit in a Subaru wagon or the back of a jeep. 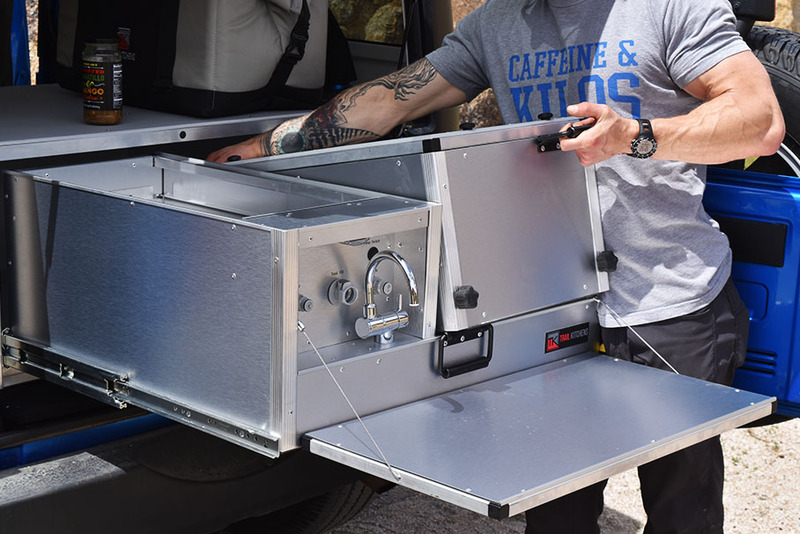 The Wrangler Camping System is a removable sliding storage system that fits in a range of SUVs. Named for the Jeep around which it was designed, the Wrangler works with Land Cruisers, 4Runners, Outbacks, and more. Made of aluminum and stainless steel, it includes a six-gallon water system with 12-volt pump, flip-down work surfaces, faucet, LED lighting, and most importantly, the brand’s Compact Kitchen. 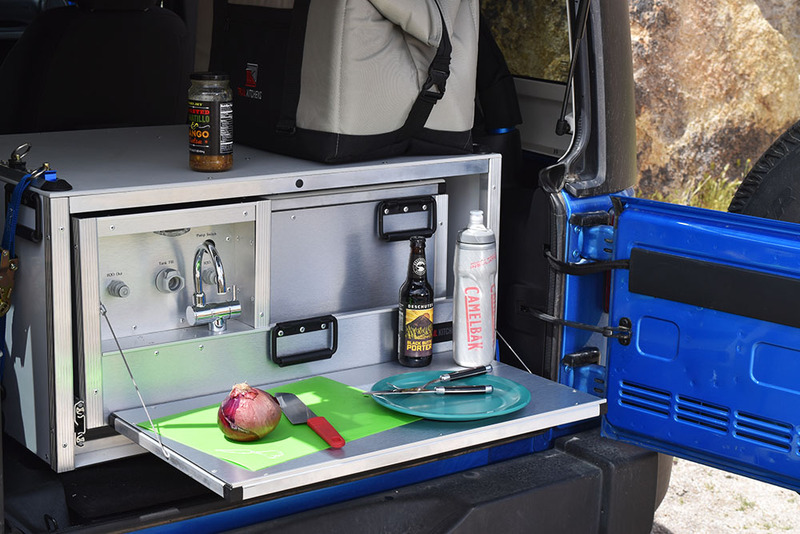 The fold-up kitchen workstation packs down to about the size of a suitcase and fits into one side of the sliding Wrangler racks. When deployed, the Compact Kitchen is a freestanding work table with drawers, hanging storage, and two flip-up surfaces. All told, it provides more than 12 ft.² of workspace. As an option, the Compact Kitchen can come fully stocked with knives, cooking utensils, and cutlery for four people. The kitchen does not include a stove, but the brand does sell a compatible fold-down cook range. 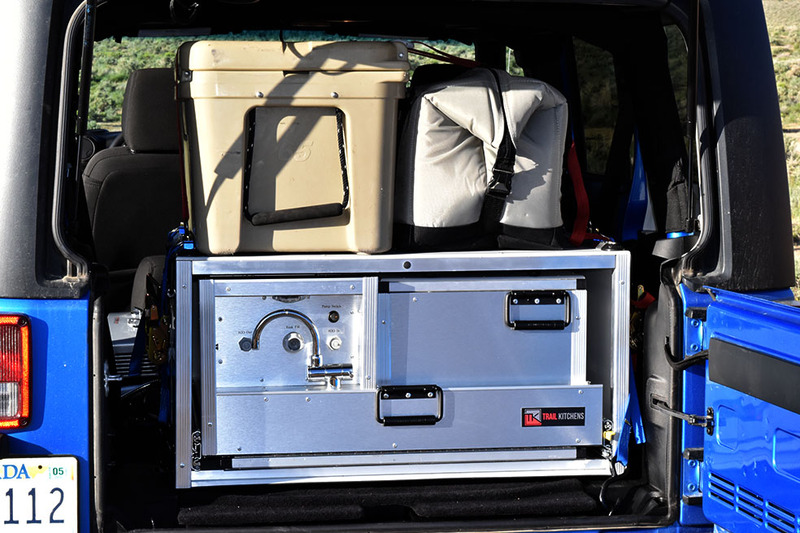 When fully packed and loaded into the Wrangler, the water system and compact kitchen measure just over 34″ x 17″ x 28″. Install and remove the system in less than five minutes with ratchet straps and tiedowns. No drilling or vehicle modifications are required. Dry and empty, the Wrangler weighs about 110 lbs. and the sliding racks hold up to 500 lbs. Power comes from a 12-volt adapter that works in your car’s power or cigarette-lighter port, or portable generator. The Wrangler also has options for sliding mounts that accommodate a 37-quart fridge, and hot water heater with shower attachments and mounting bracket. The Compact Kitchen comes with the Wrangler system, but it is also sold by itself if you just need a packable kitchen workspace. 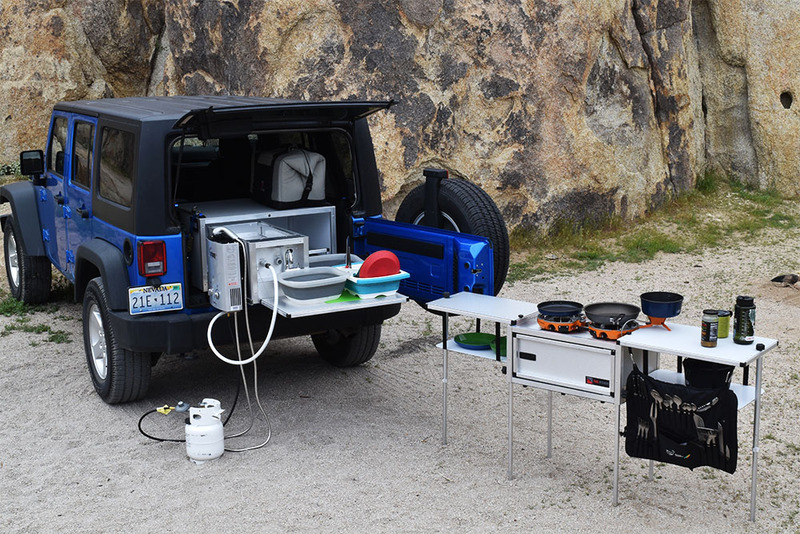 The Wrangler with Compact Kitchen costs about $2,500. It’s steep, but looks bomber, and would make cooking and cleanup at the campsite a breeze. If you have rooftop storage for your gear and love making big meals outdoors, this could be a worthwhile investment.